STEAM-y Storytime 1: Things that Go! Go! Go! Kids finish school towards the end of May here. In years past we have started our summer reading program the first week in June, leaving a gap. I have wondered if we lose kids this way, so this year we began the program the Monday after school gets out, turning the eight-week program into a ten-week extravaganza. So far so good. More kids (and teens and adults) are registered and they are enthusiastic! Another change, is better integration of the preschool storytime program that we offer every week of the year into the summer program. Instead of the habitual storytime that happens every week, I want them to be special and relevant and engaging and the happenin’ place to be! Storytimes are generally well-attended, and during the summer its economical to use the well-established storytime venue to provide summer-related programming especially for young kids instead of adding programs to a very full schedule that includes events for kids, teens, and adults. As mentioned in previous posts, I decided to develop a series of STEAM-y Storytimes for June and July (our summer program ends August 3rd) to draw attention to storytime and to try highlighting valuable STEAM (STEM + Art) elements in the storytime setting. 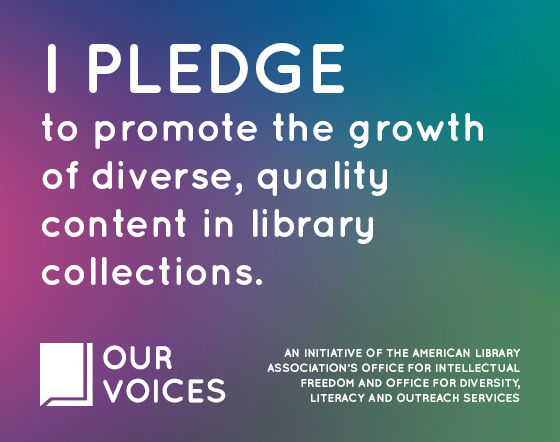 The Dig Into Reading theme we adopted for this year allows me to nicely connect storytime and the overall program. To go along with the Heavy Equipment Show and Tell we were hosting on the weekend, this week’s storytime was all about things that go. But first, I started storytime with the Rhyme Cube again. Kids really like the idea of choosing songs, and of course, the rhyming songs are great for kids’ phonological awareness! To introduce the theme of the day, I brought out my portable flannelboard which was already set up with “things that go,” including the settings for each. The kids immediately called out that things weren’t as they should be. I had the things that go all mixed up! A boat was pulling a dogsled, a train in the clouds, and so forth. Together, we got them all sorted out in no time at all. Time for stories! Find the templates here ThingsThatGo1 and ThingsThatGo2. We read just two books this week, since we were so busy giggling and talking about the two I selected. Two may not seem like very much, but I don’t set an absolute number of books to get through during storytime. Instead I focus on how we read the books. Some weeks we read three or even four, and some we read less. We were recently gifted a big book version of Mo Willems’ Don’t Let the Pigeon Drive the Bus (Hyperion Books for Children, 2003). It amazes me just how much kids enjoy this story, even if they have heard it a hundred times! With the large format pages, simple but expressive illustrations, and the interactive story, it’s ideal for reading together as a group. 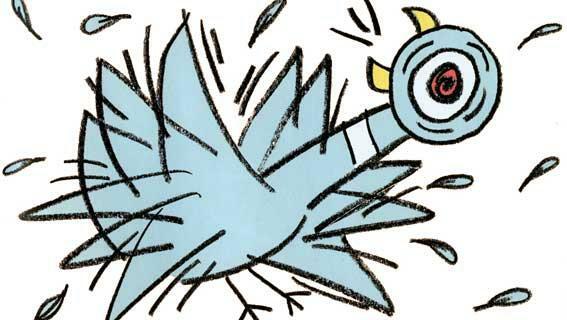 Thanks, Mo Willems! And if you haven’t seen the related app, Don’t Let the Pigeon Run This App, check it out. Before the next story, it was time to jump up and get our legs going! 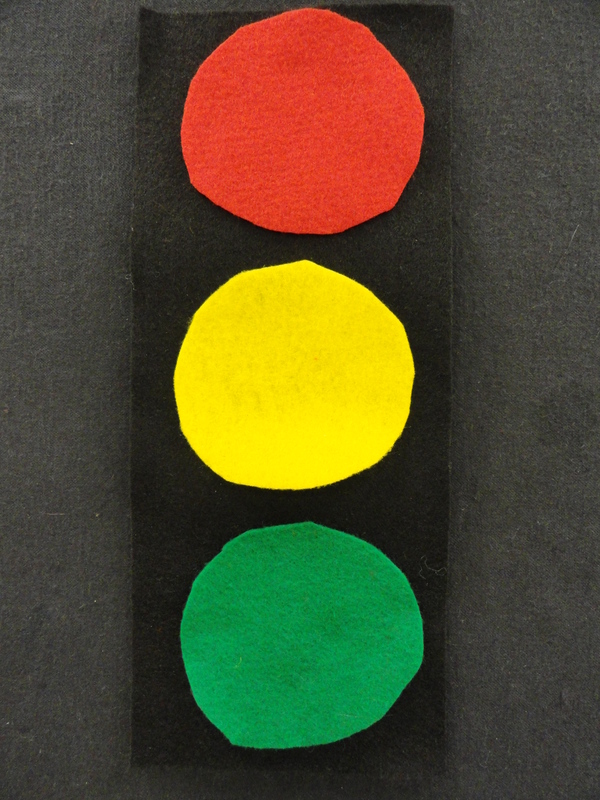 When I unfurled this traffic light on the flannelboard, the kids pointed out that it was like the single traffic light in town! 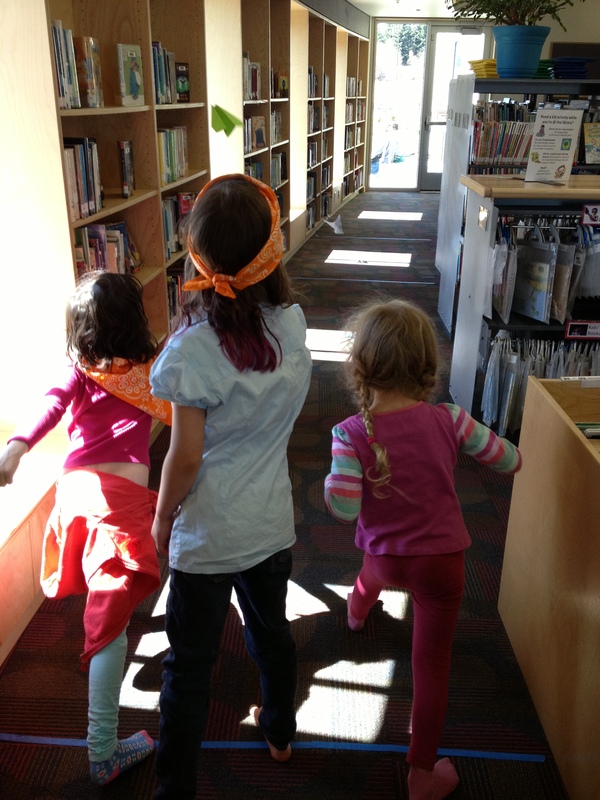 Despite the rarity of traffic signals, kids still knew what to do when we marched our way through this action rhyme. Our last story was David Shannon’s Duck on a Bike (Blue Sky Press, 2002). 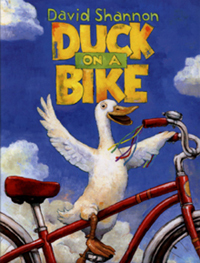 As Duck rides a bike past the other farm animals they lots to say and think about Duck’s peculiar behavior. The repetitive text and easy to identify animals are a treat for kids, as is the second to last page which features all of the animals happily riding bikes unbeknownst to the child owners inside the farm house. The STEAM-y Storytime format includes two or three activity stations after the traditional story segment. 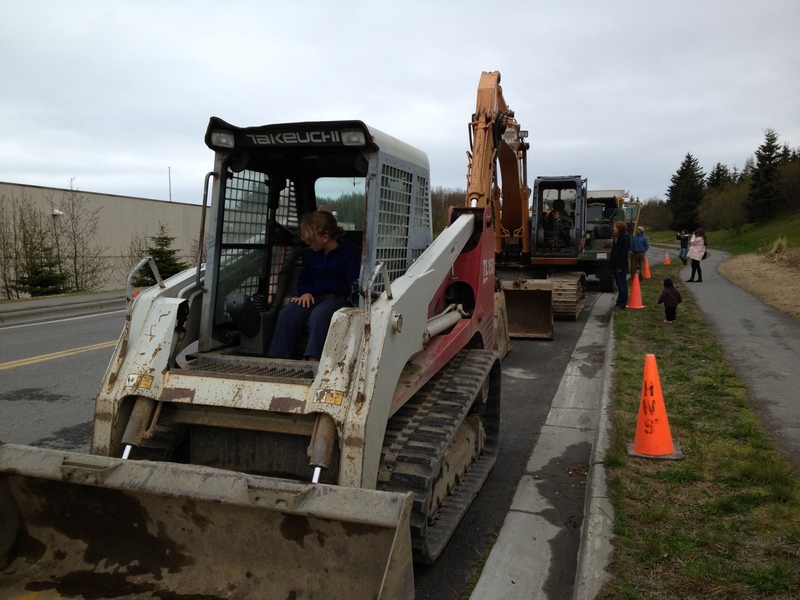 For this week, we included three stations and the average sized crowd moved from one to the other smoothly. Most children and their caregivers tried out each station. I didn’t set a time at each station, but designed the time as free exploration. With a teen volunteer on hand, the format worked very well. 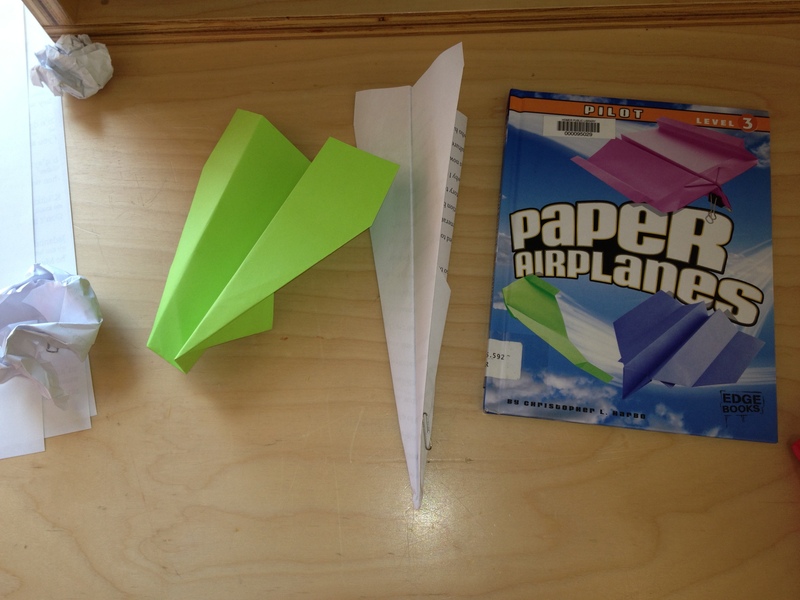 I set up an area in the children’s library that was dedicated to paper airplane building. We have several paper airplane design books including the Paper Airplanes series by Christopher Harbo (Capstone Press, 2011) which are written for various age levels, so I displayed those at the station along with paper in a variety of weights and colors. Paper clips, tape, and fasteners were also on hand so kids could experiment with weight distribution as they tested their planes. Once their planes were engineered, kids had a chance to see how they flew. A long area between stacks offered a great spot to lay tape at various intervals so kids could measure how far their designs could fly. There was even a contest or two! Many of the younger kids were immediately attracted to the car color matching station. 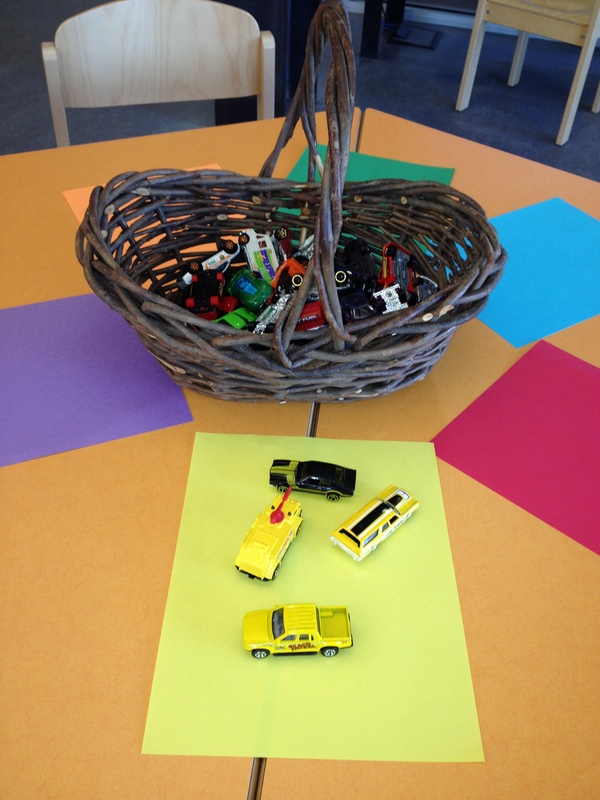 I placed a basket of toy cars and trucks in the middle of the table with colored construction paper in a circle around it. Kids quickly started placing cars on the sheets based on their body color. I encouraged caregivers to help the little ones count the matching vehicles and also find other ways of matching the cars based on the color of their wheels, windows, and racing numbers, for example. Did kids play with the cars after they matched them? Of course! The art station was all about creating a collage which I found over at Sturdy for Common Things. For this station, I set out large pieces of blue construction paper for the backdrop along with wavy black paper strips to represent a curvy road. 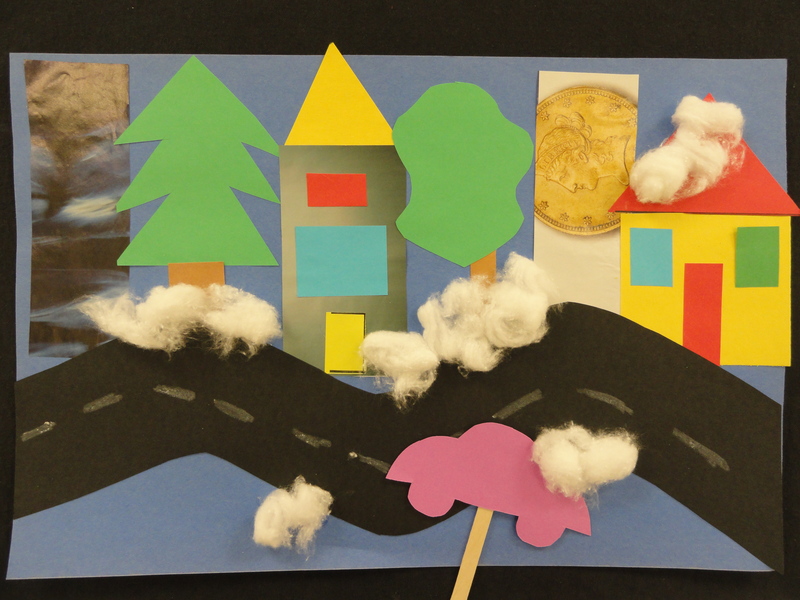 Kids used the magazine scraps, other construction paper, and cotton balls to create buildings, trees and clouds/fog. 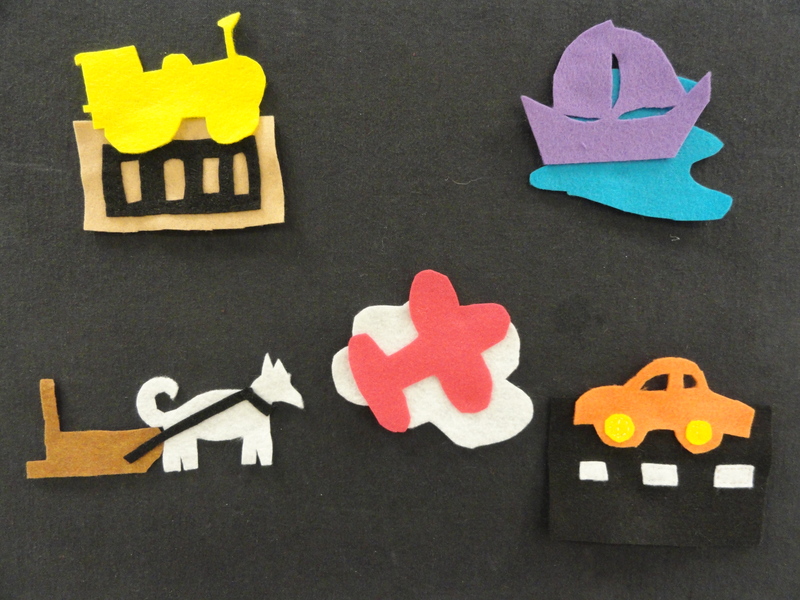 I cut out small cars and glued them to popsicle sticks so kids could drive them on their newly crafted roads, turning their artwork into something interactive. At other “Things That Go” storytimes, I have also provided materials to make toy cars for racing on a race track made out of blue tape on the carpeted floor. 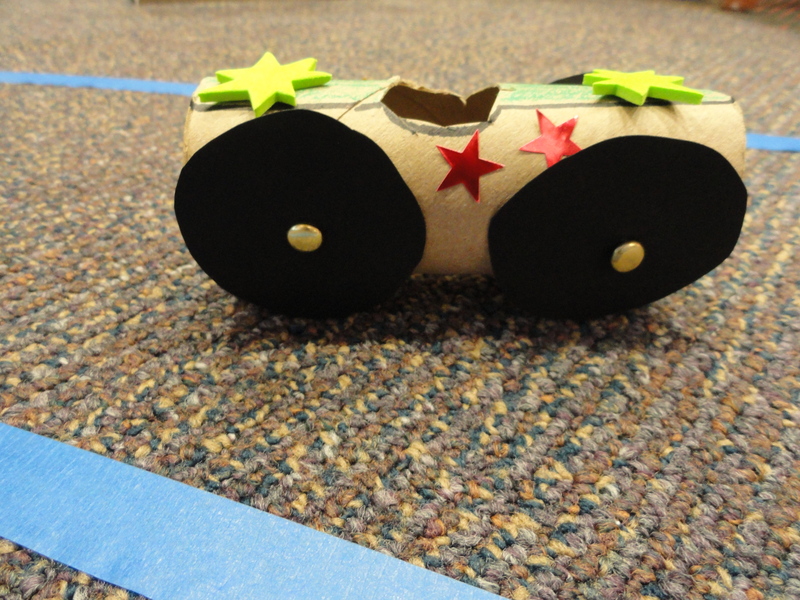 Creating the cars and racing them offered great opportunities for language development and using their budding narrative and social skills as kids raced around the track together.